The latest ugliness of assault and murder against a group of people–the attack at the Inland Regional Center in San Bernardino CA–results in more calls for reasonable gun control by many. But here’s the deal. No one in the Republican leadership–Congress or the Presidential candidates–is saying anything about control. They express sympathy for the community, and those who grieve the loss of loved ones, but not a word about doing something to stem the tide. And you know what is really outrageous? Congress has not even given terror-fighting agencies the authority to deny guns to those on the nation’s no-fly list. What’s more, they have refused for decades to put any funding into research on gun violence. That’s the power of the gun lobby, particularly the NRA (National Rifle Association). They claim to represent gun owners and hunters. I have known a lot of hunters in my lifetime, and I feel certain that most of them would agree that denying guns to people our government, for security reasons, doesn’t let fly around the country is a reasonable measure. And I believe most of them would think that research into ways to deal with, and respond to, gun violence is a reasonable measure. But the NRA and others have terrorized the GOP, and some Democrats, into thinking that any departure from gun lobby orthodoxy is political suicide. I want to blame the NRA because they bear great responsibility. But the ones I really blame are the spineless legislators and leaders who refuse to act, again and again, in the face of rising violence through the ready availability of hand guns and assault rifles. There are so many different types of people who commit these horrific acts–mentally unstable, angry religious extremists, sullen former spouses and employees, abortion haters–but they all have one thing in common.They can easily get their hands on guns. Guns are the common denominator. In the case of San Bernardino, these included assault weapons. Why can anyone other than police and soldiers get access to assault rifles? Why is everyone who wants to buy a gun not subject to a background check? Such checks will not prevent law-abiding people from getting guns, but they can help make sure others do not. I don’t like to call people names, and certainly not whole groups of people. So I won’t use a label on these leaders who fail to lead, but I will name their behavior: cowardice. I don’t know how many of them actually own guns, or use them, but what I see are people who are supposed to be out front leading who are, instead, standing behind cover provided by the political guns of the NRA. In my book, that’s cowardice. 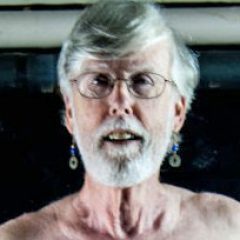 How many more of these horrific situations–how many more school children, college students, public employees (including police of course), people with developmental disabilities (as in San Bernardino), ordinary citizens, mothers and fathers, will we have to lose before they find their spines? I am praying that one of them, just one, breaks ranks and moves from cowardice into bravery–maybe even acting with courage and conviction like the police officers and emergency personnel, and many civilians who reach out to help, who have to respond when yet another gun-toting killer strikes. 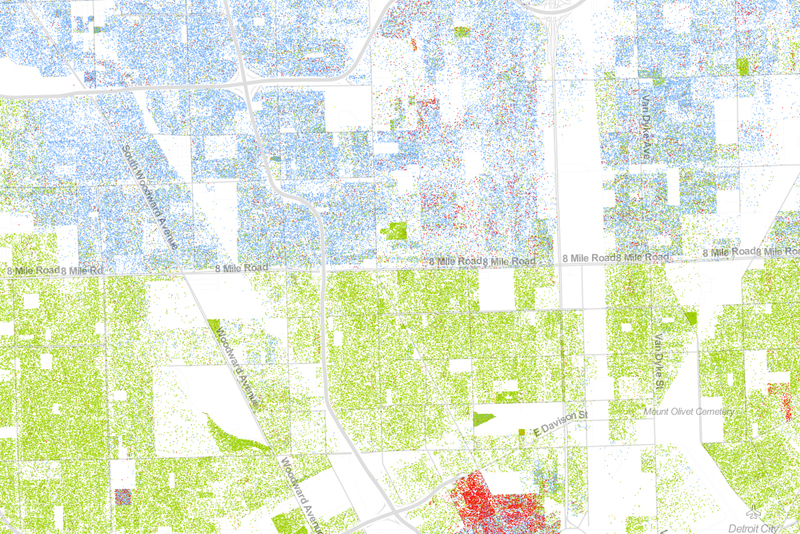 Segregation Then, Segregation Now . 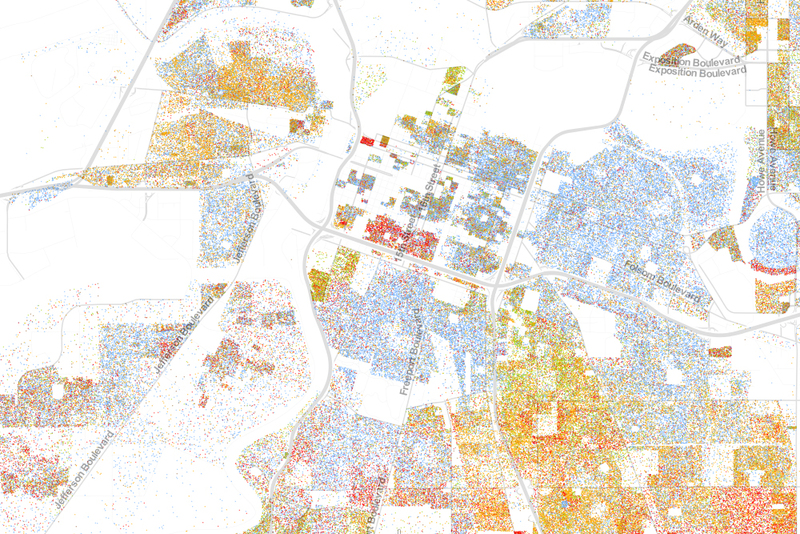 . . Segregation Forever? The election of Barack Obama, and his re-election, caused some to think the United States had moved to a new level of racial justice and harmony (well, harmony anyway). The recent bout of killings in all parts of the nation, the reminder that although things are much better in New Orleans poor Black residents still face daunting odds in getting their lives back (and when the storm struck 10 years ago they were the ones most often the victims of disinterest in their plight), and ugly comments about immigrants and proposals aimed at them, remind us that all is not well in the still-racialized United States. 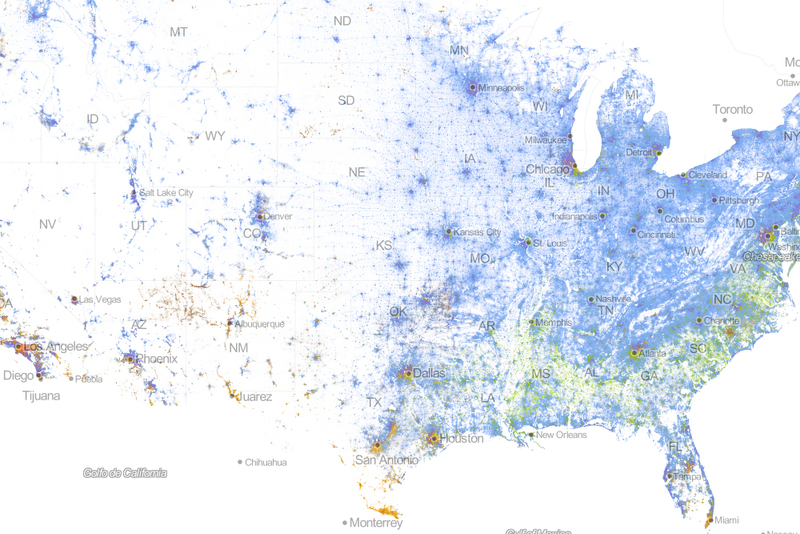 Friends on Facebook just made me aware of an intriguing map project which marks how segregation still haunts so much of the country. There has been much work to achieve housing desegregation, but many experts have pointed out that just because a place is less segregated it is not necessarily truly integrated. And as this map project makes clear, some places–California cities may be the best example–are far more integrated than others. You can check all this out for yourself here. I checked out Detroit, knowing that it is considered by some to be the most segregated city in the nation. I am a native of Michigan–Oakland County to be more precise, the jurisdiction just north of the Detroit city limits. Eight Mile Road dividing the city and the county, was, when I left Michigan in 1981, a racial dividing line. And it still is today! The color contrast on the map–like the color contrast on the ground, is stunning. Across the southeast United States, where I lived for 12 years in Richmond, still shows much of the historic pattern of the Black Belt, originally labeled because of the rich soil but later so named because of the prepondance of slave-labor plantations. The good news is that there have been changes. The bad news is that on the whole we remain a nation visually, and viscerally as recent events indicate, divided by race. The divisions are not accidental. They are the result of long-held ideas, practices and policies. The good news is that means we can change them. The bad news is that so few seem interested in doing so. Why can’t we still get Congress to overcome the gutting of the Voting Rights Act? Why can’t we get better training for police in dealing with highly emotional encounters between Black people and police? Why is that Black transwomen are still far more vulnerable to attack and murder than white ones (not that either deserve this treatment)? Why is that poverty still impacts the Black community far more than others? 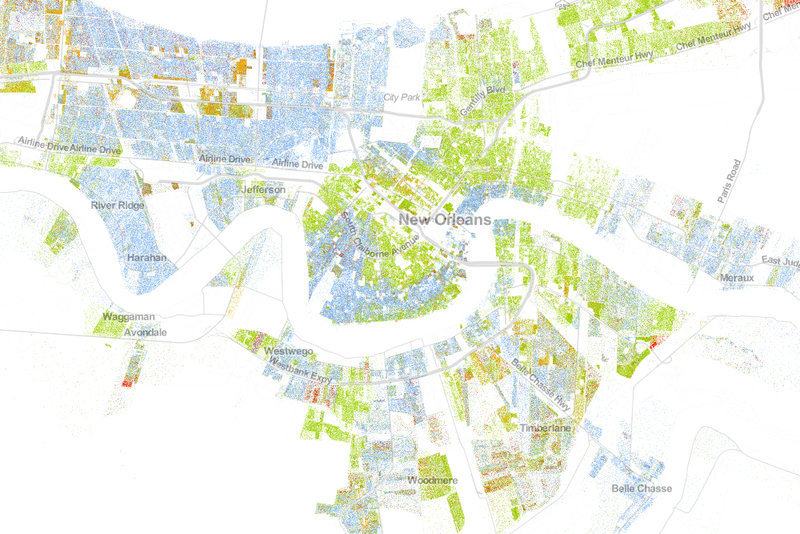 And why can’t the progress in New Orleans be more balanced? Why can’t build a truly multi-racial society? If you think we have done that, look at these maps. And then think back to January 1963, when then Governor George Wallace of Alabama made his pledge, “segregation now, segregation tomorrow and segregation forever.” We have made progress, but so far Governor Wallace still has much evidence to support his claim.